What is it that Geochemists do on the JR? Just coming off a seriously busy several days here on the JR, as we’ve been bringing up a bunch of new cores from several sites on the summit of Yinazao Seamount. Now we are going to drill a second hole, this one to ultimately do real-time tracking of the upwelling fluids that course through and really are responsible for making these serpentine seamounts. This second hole will be cased, and prepared for new instrumentation that will be installed on a future cruise from a different ship. As it’ll take several days to drill the second hole, we have some low-ebb time to get caught up in the lab and to complete the Site Reports that each of the different laboratory teams on the ship are responsible for writing, explaining what they found from all the work they just finished. 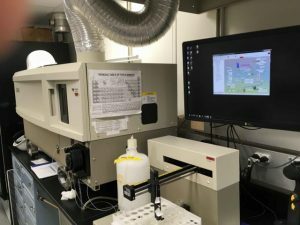 So: what is it that a Geochemist (like me) does on the JR? As it turns out, on this Expedition we have a lot to do – really more than we had to do the last time I sailed – but IODP has automated a whole lot more of it since then, so it doesn’t feel like so much work – aside from the running up and down the stairs a bunch of times each day! 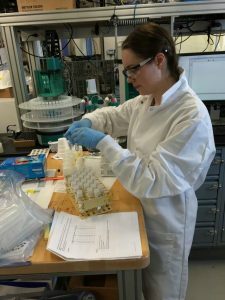 The Geochemistry team is responsible for all the chemical analyses of all the samples, both for any of the rocks we recover and for the serpentinite muds, and the Interstitial Waters that we extract from those serpentinite muds. There is A LOT of scientific interest in the interstitial waters that we’re extracting, probably more than in the serpentine rocks and muds (!?! 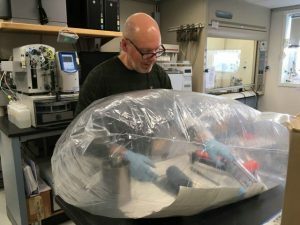 ), so aside from getting the water out of the core materials, we have to divvy it up among 20+ scientists – which means, we have to squeeze a whole lot of water out of these cores. What this means is: at every call of “Core on Deck!”, either I or my Geochemistry night shift colleague (or both of us!) race up the stairs to the Core Lab and out on the Catwalk, where we look at the new core in its liner, and with the Co-Chief Scientists and the IODP Technicians identify a section (of between 10 and 30 cm, depending on the depth and the need) that will be squeezed for Interstitial Water. We then race it down the stairs to our lab one deck below, where we put it in the refrigerator to cool it down to seafloor temperatures again (~1 hr) before we can prepare it for squeezing. To get it ready to squeeze, we need to cut away any part of the core that was in contact with the core liner or the potentially dirty implements on the Catwalk – and we can’t do that in the air, because it might change the chemistry of the fluids. 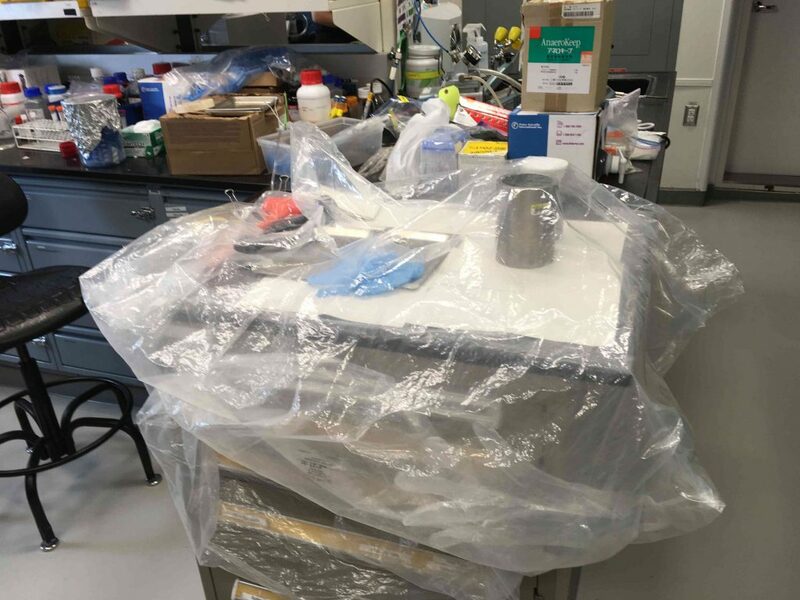 So, we work in this thing called a Glove Bag (see above, right): it’s a quick-and-dirty isolation space, which we flush out with Nitrogen gas, so the core and its fluids won’t oxidize. We cut the outside stuff off in the bag with metal spatulas, and stuff the rest into a heavy, stainless steel squeezer apparatus. 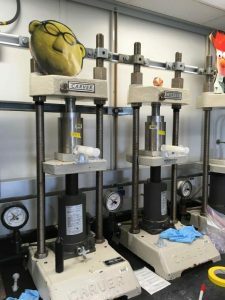 These squeezers are then put on high-pressure presses, where we gradually jack them up to over 20,000 psi pressure, which causes the serpentinite mud to (grudgingly…) release its Interstitial Water. For 30 cm of pretty dense and ostensibly dry-ish serpentinite core, we can extract upwards of 100 ml of Interstitial Water – in about 2 hours or more for each sample! It’s good we can get so much fluid out, because of all the folks on the ship who want to take some of it home to work on, as well as the amounts necessary for shipboard analyses with our ICP-Optical Emission Spectrometer (right) or one of the dozen other analytical tools we have onboard. 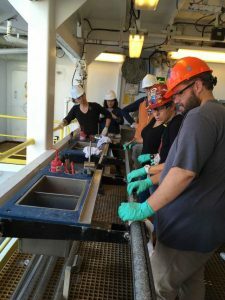 The IODP Technicians run the instruments mostly, while the Geochemists are responsible for squeezing out the waters and prepping and diluting them for onboard chemical analysis – while squeezing out fluids and running up to get more core to squeeze (and let’s not even talk about the rocks yet!). The upshot of all this is, while we’re drilling in the serpentinites, the Geochemistry Lab is a hopping place! We’ll be playing catch-up the next several days while the drillers do their thing, and we’ll be catching our breath ahead of the next seamount we’re slated to drill.